The knock on effects from this can soon manifest and before we know it, we can feel very drained, tired, almost negated in fact and it can be at these times, where we can reach for a crutch, seemingly to help us through, yet these vices and habits we pick up are doing us no good at all, we all know that, yet often it can seem impossible to give them up. Whether you would like to quit smoking, maybe you feel you would like to lose some weight, or just would like to feel happier and more positive about yourself and the life you lead, call me and I can help you. If you have reached this understanding and are determined, then I can help you to achieve the above mentioned and many more ailments, vices, habits and personal to you problems which you feel you would like to combat and overcome. Once you have reached the point where you wish to confront and overcome these, ring me for an initial free consultation and then visit me near Yeovil, guide you into and through a deep and relaxing meditation, then whist under Hypnosis, I can suggest ways in which to stop, basically removing any habits that you feel you would like removed, replacing them with mindfulness, wellbeing and a positive outlook, all of which will aid you in a healthy lifestyle. Hypnotherapy has been practiced for many centuries with great success and whilst there is no actual date of origin, it is known that the Ancient Egyptians practiced this art and can be seen in many of their paintings and etchings. Providing an overall holistic and alternative therapy, Hypnosis really can let you leave behind and quit many habits that you feel are restricting you in your life, leaving you healthier with a great sense of achievement and pride. This non-invasive therapy is highly regarded across the world and is used in many cultures as well for all types of situations. From quitting smoking, maybe you get nervous at exam and test time, you could feel you are over eating, whatever you feel is a problem to you can be overcome and once you realise you want to face it, you are halfway there. From the first contact, I will listen to your individual needs and put a package in place for you, then we can make further arrangements where I will place you under Hypnosis and your journey to a new you will begin. 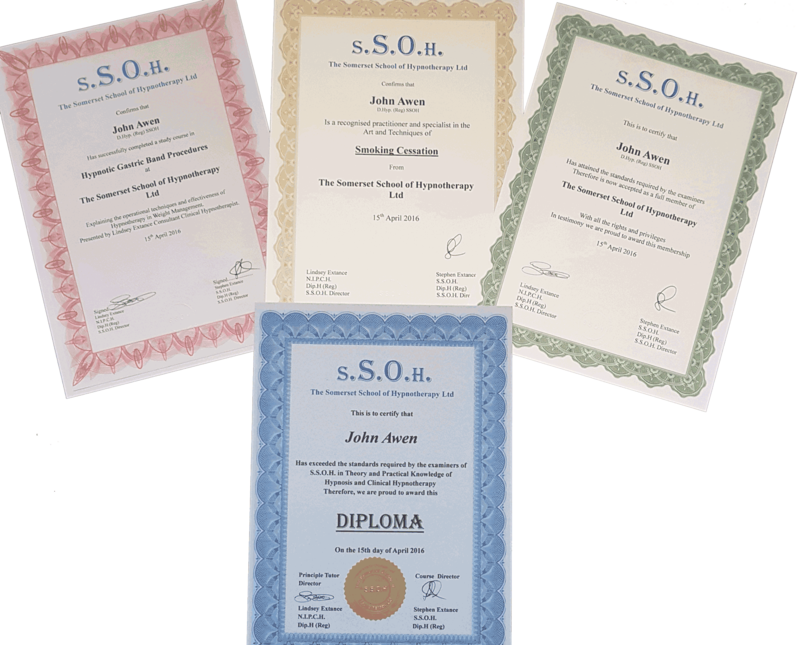 Having trained with the Somerset School of Hypnotherapy, I am fully accredited by them and was awarded an official and fully recognised Diploma, in the theory and practical knowledge of Hypnosis and clinical Hypnotherapy. Based in South Somerset I will travel up to an hour to come and see you in your own home, phone, or e-mail me for more information and let your Hypnotherapy journey begin. After any course of Hypnotherapy, I provide after care and full support should you need it. Having had great success in helping people to quit smoking, to lose weight and helping them to become more positive, I offer some packages below, also if you would like to discuss something else that I haven’t mentioned, then please call me. If you are interested in trying hypnotherapy, we have several proven scripts available to download from our Shop.